Once again, the irresistible force of the Chicago Teachers Union is pushing against the immovable objects of City Hall and the Chicago Public Schools. This week, teachers take a second vote to authorize a strike. If no agreement is reached, a walkout could take place as soon as mid-October. What’s different now from 2012, when teachers walked picket lines for seven days? Number one, the district’s finances are in worse shape, due to skyrocketing pension debt and declining enrollment. Despite new state and local taxes dedicated to shoring up Chicago’s teacher pension fund, this year’s schools budget still depends on $205 million that won’t arrive unless the governor and the state legislature can make a deal by January on state pension reform. Second, city and union leaders have recognized they are stuck with each other. Despite the union’s best efforts to unseat Mayor Rahm Emanuel, he won re-election after a 2015 runoff. Last spring, CTU President Karen Lewis ran unopposed and automatically won another three-year term. CTU leadership now faces a crossroads. The union is caught between making a bread-and-butter deal for its members and pushing its left-leaning political agenda. If teachers strike, it’s hard to see how they’ll force a change big enough — to either their paychecks or city politics — to satisfy their membership that the effort was worth the cost. Moreover, the solutions to the district’s immediate and long-term problems likely lie in joint pressure from the district and the union to change state law, including the state’s notoriously inequitable education funding formula. The lack of a contract is already costing the system. Uncertainty over the district’s stability is pushing teachers, principals and middle-class families out of the city. Plummeting enrollment has triggered some 500 teacher layoffs, and more could be on the way when enrollment is finalized on Oct. 1. The opportunity costs may be even higher. While other unionized districts like Baltimore and Washington, D.C., have tried innovative salary approaches, there’s virtually no chance we’ll see a breakthrough change this time around in how Chicago’s teachers are paid. 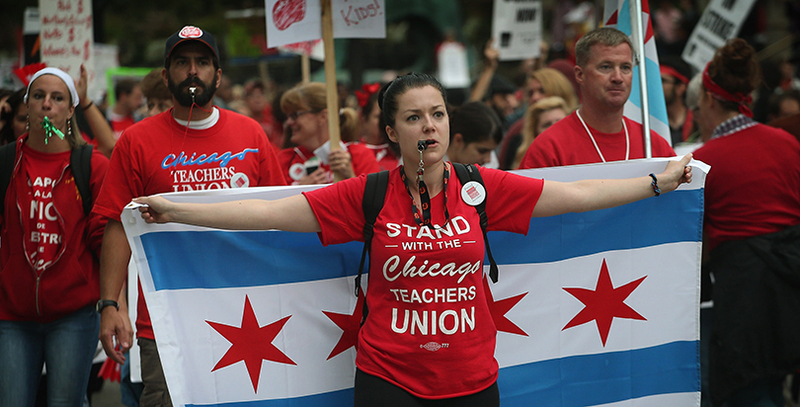 Nationally, Chicago’s struggle matters because districts all over the country face financial pressure from rising pension costs, and other unions are borrowing from the CTU’s playbook. The current contract fight centers on pay and pension contributions at a time when the district’s finances are frighteningly close to those of 1979, when money ran out and teachers briefly went without paychecks. Chicago Public Schools is offering teachers a modest raise even after requiring them to increase their pension contribution. But so far, the union refuses to accept any pension contribution changes. Another wrinkle concerns pay for the most experienced teachers. To calculate the raise, the district is including pay increases for additional experience and education that are already built into the salary schedule. But a group of between 4,000 and 5,000 teachers who have been on the job for 14 years or more no longer receive increases for experience, or “steps,” every year. They would take salary hits in years two and three of a proposed four-year contract before coming out ahead in the end. Ensuring veteran teachers’ pay holds steady throughout the contract — an $8 million proposition — could be key to a deal. Who should pay for pension contributions? In 1979, when fiscal mismanagement briefly stopped teachers’ paychecks and threw the system into state receivership, CPS and union leaders agreed that, in lieu of raises, the district would pick up the lion’s share of teachers’ required contributions to their pension fund. This “pension pickup” would hold the district’s total compensation costs steady but put more take-home pay in teachers’ pockets. More than 30 years later, Chicago Public Schools is still picking up most of its teachers’ contribution to their pension fund: seven percentage points of the 9 percent required. And CPS is far from alone among Illinois districts in using the practice. As of 2015, nearly two thirds of Illinois school districts were picking up all or part of their teachers’ pension contributions. “That is a practice which is extremely common in Illinois but not common outside,” says Kency Nittler, manager of teacher trends for the National Council on Teacher Quality. While few parents of children in Chicago’s public schools openly criticize teachers, there’s plenty of critique of the union’s pension pickup position among the commenters at CPS Obsessed, a blog primarily aimed at parents seeking to enroll their kids in the city’s top public schools, many of which require admission testing. To make it easier to swallow, CPS is offering to phase in the contribution change gradually. Depending on the point in their career, Chicago teachers rank first or second in pay among large urban districts, according to a recently published analysis. With a median salary of $78,169, Chicago teachers’ pay is also very competitive with that in many neighboring suburban districts. However, two dozen nearby suburbs have higher starting pay than CPS, and seven have higher pay for the most experienced teachers. Ironically, the union’s rigid insistence on pay tied solely to education and experience may make it harder for the district to compete creatively on salary. Like many school districts across the country, Chicago Public Schools pays its teachers according to a “single salary schedule,” which sets a base starting salary for entering teachers and scheduled “step” pay increases for each year of experience and “lane” increases for additional education beyond a bachelor’s degree. The single schedule for all teachers was intended to end salary differentials for elementary and high school teachers and to eliminate racial and gender pay gaps. But strict salary schedules eliminate the opportunity to use pay as a tool to improve the quality of a district’s teaching force. For example, there’s no way to offer incentives to attract new teachers in high-need subjects or pay bonuses to high performers. “If you’re stuck with a single salary schedule … you’ve taken an important management tool off the table,” argues Dan Goldhaber, who teaches at the University of Washington and serves as a vice president with the American Institutes for Research. Over the past decade or so, an increasing number of districts have begun experimenting with new pay structures, says Nittler, from the National Council on Teacher Quality. While not eliminating pay for education and experience, some have focused on performance pay; others have created career ladders that offer teachers more money in exchange for taking on leadership roles or mentoring other teachers. Either way, “we’re seeing more and more districts stepping away from step and lane,” she says. The council’s 2014 report, “Smart Money,” shows that only 30 of the 113 large districts studied, including Chicago, relied solely on experience and education as the basis to increase teachers’ pay. History suggests that bringing innovative pay to Chicago will be an uphill climb. “From the 2012 strike, CPS wanted to reform or get rid of steps and lanes. They did not succeed in getting rid of them four years ago,” notes Bobby Otter, a former CPS budget analyst and now budget director for the Center for Tax and Budget Accountability. Ultimately, everyone agrees that the long-term answer to the district’s fiscal woes — and the teachers’ demands — is to find more money. That’s not easy in Illinois. It would require major policy changes like expanding the state’s narrow tax base and overhauling its unfair education funding formula. This legislative year saw a nascent effort to change the Illinois constitution to permit a graduated income tax. But none of those fixes will happen quickly or without a fight. The union and other left-leaning activists argue that the city should also be sending more than $205 million in surplus tax-increment finance (TIF) funds back to the schools. (TIFs are special taxing districts that allow cities to reallocate property taxes from so-called blighted areas to encourage investment or redevelopment within that district.) The same week the water tax hike was approved, an ordinance that would have created a new process for determining surplus TIF money and sending it back to schools stalled in the City Council Finance Committee. But since 1995, the union’s ability to bargain over anything beyond wages and benefits has been tightly curtailed by law. On April 1, the CTU staged a one-day walkout in partnership with other labor and grassroots organizations. The union called it a protest against unfair labor practices by the district and the state’s failure to set a budget and fund public schools adequately. The Illinois Educational Labor Relations Board ruled that action illegal because teachers went off the job before a required fact-finding process had been completed. Three of the five current members of the labor relations board were appointed by Gov. Bruce Rauner, whose opposition to public-sector unions is well known. In fact, the union says part of the reason it decided to hold a second strike authorization vote this week was to avoid any potential legal challenges. Any attempt to strike over issues that go beyond the union’s legal scope won’t find a sympathetic ear on the state board. If the union votes a second time to authorize a strike, as expected, its House of Delegates could vote to walk out as soon as early October. The union is legally required to give 10 days’ notice, which could set a strike in motion around October 17. If the Cubs manage to break their curse this year and head to the World Series, will anyone be paying attention? Who knows? Fong feels a little overwhelmed by trying to assimilate all the new information about her students, her school and her contract offer. “There’s all this information coming into my brain, so I can hardly think about the contract,” she says. The idea of walking out so soon after walking in seems unreal to her: “Am I gonna walk a picket line? I don’t really know.” Given high turnover among CPS teachers, Fong likely represents a large share of the teaching force, who weren’t around in 2012 and have never participated in a strike. To keep teachers like Fong in their classrooms, says Harvard negotiations expert William Ury, it’s important to frame the contract talks correctly.